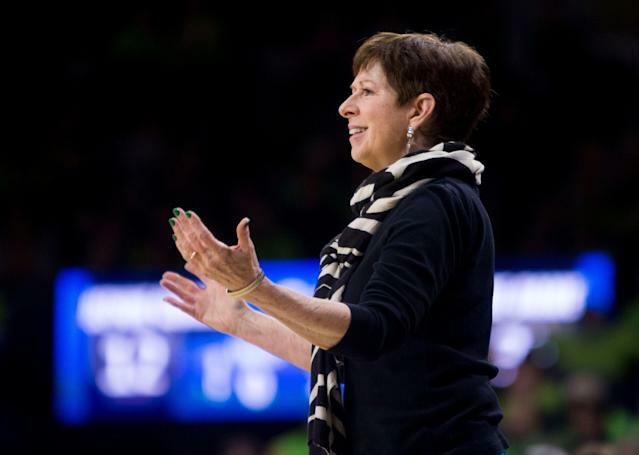 Muffet McGraw is a national champion, having coached the Notre Dame Fighting Irish through a thrilling 2018 tournament for the women’s basketball title. She is not, however, a champion at escape rooms and made her displeasure at her staff’s failure in this endeavor quite clear. Wayne Drehs detailed the competitive stress ball that is Muffet McGraw in a feature out Friday for espnW. Her husband of 41 years, Matt, chimes in a few times about McGraw’s competitive gardening and team-stacking strategy to win game nights. All fun, comical, relatable stuff. But it’s a team bonding outing to an escape room, coupled with McGraw’s harsh post-escape comments, that really stands out. “I was all about winning and competitiveness,” McGraw told the magazine about her post-collegiate life, though it clearly still applies. Niele Ivey, a former player and now Irish assistant, told espnW: “She's the most competitive person I've ever met. At everything." Even now, five months after the failed escape, McGraw bristles at the mention of the event. "It was supposed to be this bonding thing, but it was not fun. I really didn't enjoy it. You have to have a diverse skill set. Everybody has to be good at something. And we had a lot of people who were good at nothing." If an escape room stings that much, we can only imagine the heat she’s going into the tournament with after two stunning ACC losses to Miami and North Carolina this season. Assistant coach Beth Cunningham said when McGraw hosts game nights, they “keep playing until she wins.” And it seems others weren’t aware of this. "I said to the guy when we left, 'Didn't somebody tell you, when we leave, we have to win?'" Cunningham told espnW. "'Because now it's going to make the rest of our day miserable. We just can't lose like that.'" The Irish staff may have been “good at nothing” in an escape room, but it’s sure good at a lot of things when it comes to coaching. No. 1 ranked Notre Dame is the favorite to win another title and shot into the Sweet 16 with ease. The ACC tournament champions rarely win by anything than at least a 20-point margin in recent weeks. The team won, 92-50, in the first round and 91-63 in the second round. They play Texas A&M in the Chicago regional semifinal Saturday. The Irish average 89.2 points a game, best in the nation, led by 2018 tournament title hero Arike Ogunbowale. The 5-foot-8 guard averages 21.1 points per game and is one of four finalists for the 2019 Naismith Trophy awarded to the best college women’s basketball player. It’s not only her. The Irish have arguably the best starting five on the court with every player — Ogumbowale, Jessica Shepard (16.7 ppg), Jackie Young (14.9), Brianna Turner (14.5) and Marina Mabrey (13.0).— averaging double figures. McGraw expects her team to win and her staff to as well.